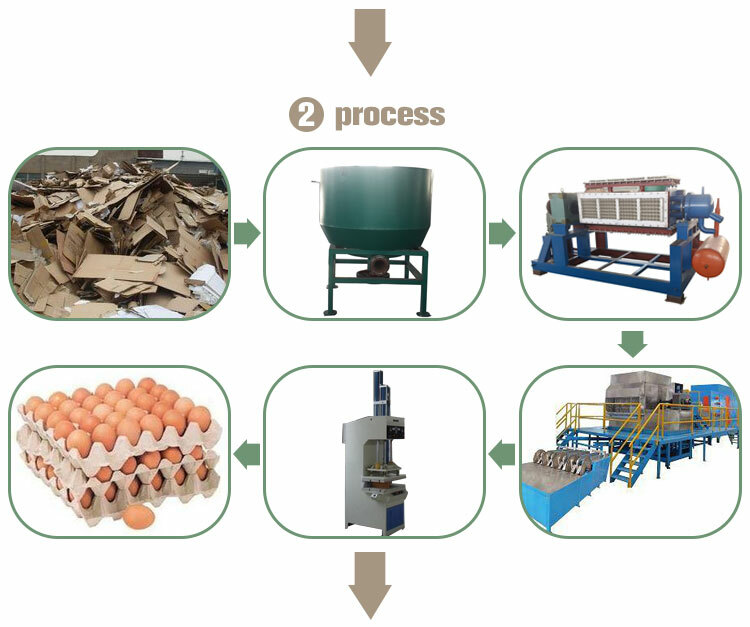 The small egg tray machine used for the making the molded pulp products,such as egg tray,egg carton/box from waste paper.small invest.Our egg tray making machine is suitable for variety scale production plant.It can produce egg cartons, egg box, egg tray, bottle holder, agricultural culture fruit tray, coffee cup tray,ect.The product can be recycled, is a new green packaging, is not only the development of environment-friendly enterprise, also long get rich choice. 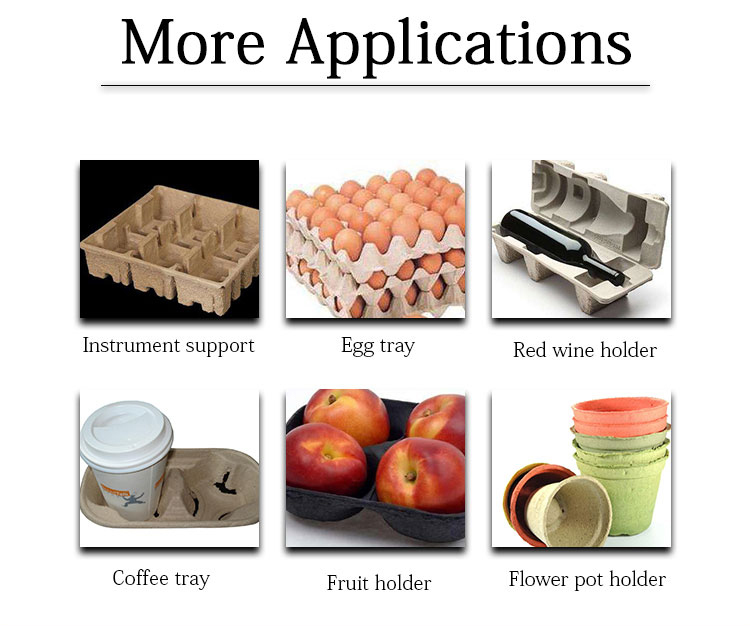 1, mainly producing the pulp molded products,such as egg tray ,egg box, fruit tray,coffee tray. 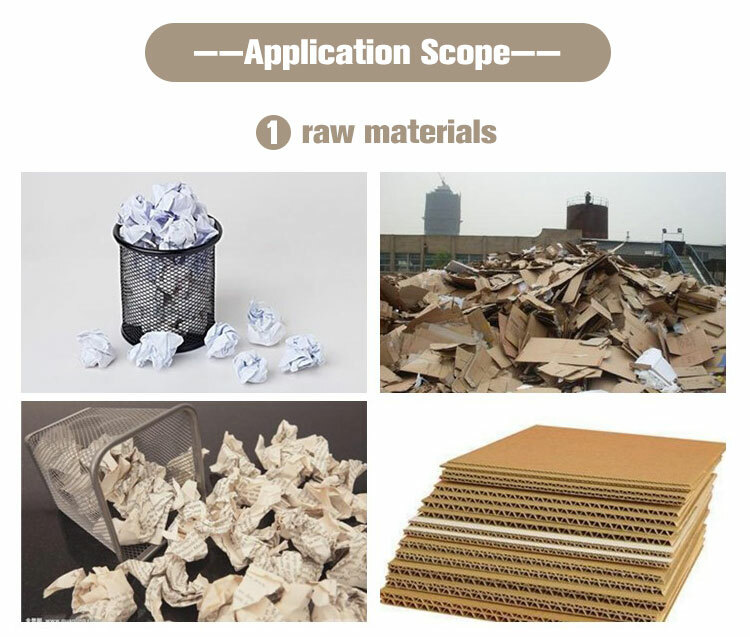 2, Material for the molded pulp products is waste paper,corrugated paper,waste newspaper,magazine. 4, stainless steel pulp tank,the surface of platens covered with stainless steel. 1. 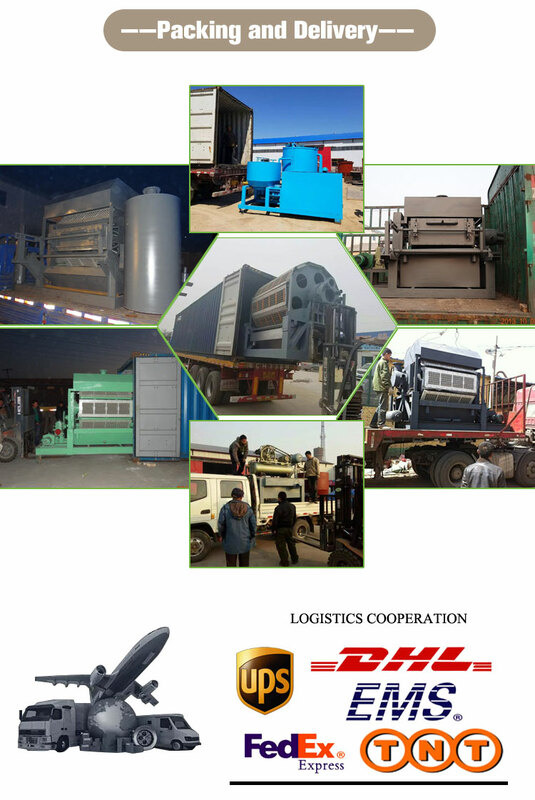 Put the prepared raw materials, such as waste paper boxes, newspapers, etc., into the hydraulic pulping machine slurry. 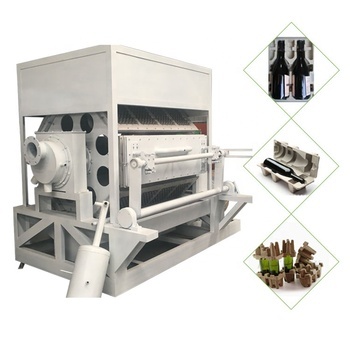 The pulp fibers are formed under the action of shearing force and friction of the water flow, and the prepared pulp is introduced into the storage tank for use. 2. Introduce the pulp in the slurry tank into the first homogenization tank, while filtering out the impurities in the pulp to adjust the pulp concentration. 3. Introduce the adjusted concentration of pulp into the second homogenization tank for the second agitation treatment. Add the pigment or water repellent and other materials as needed to stir well. 4. The slurry pump draws the adjusted pulp into the molding machine for molding. When the molding die above the slurry tank is completely immersed in the slurry, the slurry is adsorbed and gathered toward the surface of the mold under the vacuum suction on the back of the molding die; because the surface of the molding die is uniquely filtered with a hollow structure, it is gathered. The pulp fibers in the slurry adhere to the surface of the mold, and the water is pumped away to form a wet sputum. The wet sputum adheres to the surface of the mold. 5. 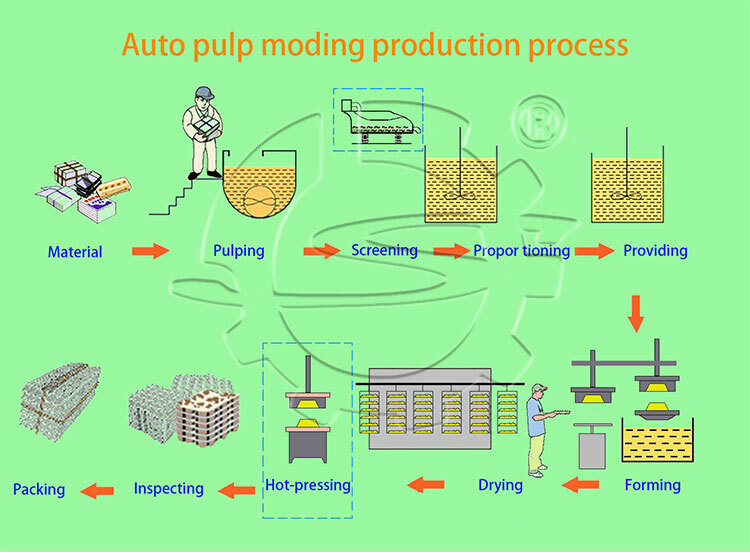 When the molding machine is formed, the moisture in the pulp is pumped out through the vacuum pump, and the extracted sewage is discharged into the sewage pool. 6. The sewage in the sewage pool can be recycled, and the sewage is introduced into the hydraulic pulping mechanism slurry or the homogenizing pool to adjust the pulp through the sewage pump. 7. The tray wet tissue layer attached to the surface of the mold is about 2.5 mm thick. It contains about 75% moisture and needs to be sent to the drying line (temperature 120-180 ° C) to remove water. 8. 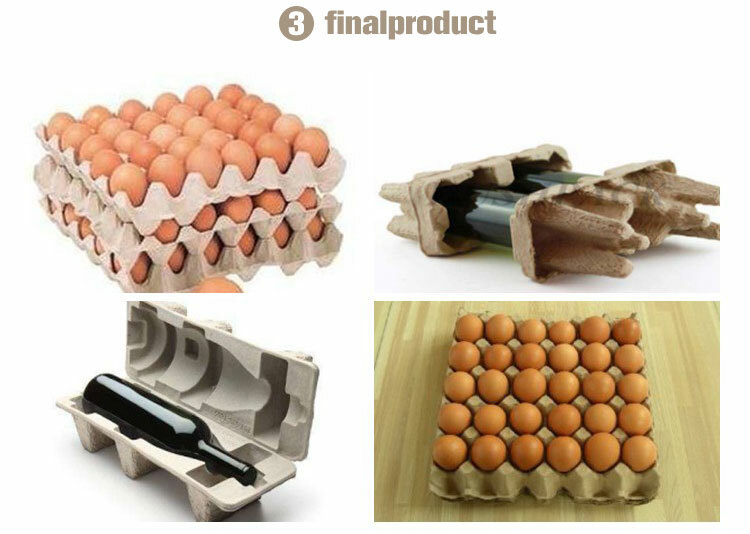 Pack the dried egg tray into the warehouse. Workshop:More than 800 square meters,Height more than 4 m .
Production capacity:3000 pcs/hour. (30-eggs tray, ~65g/pc). 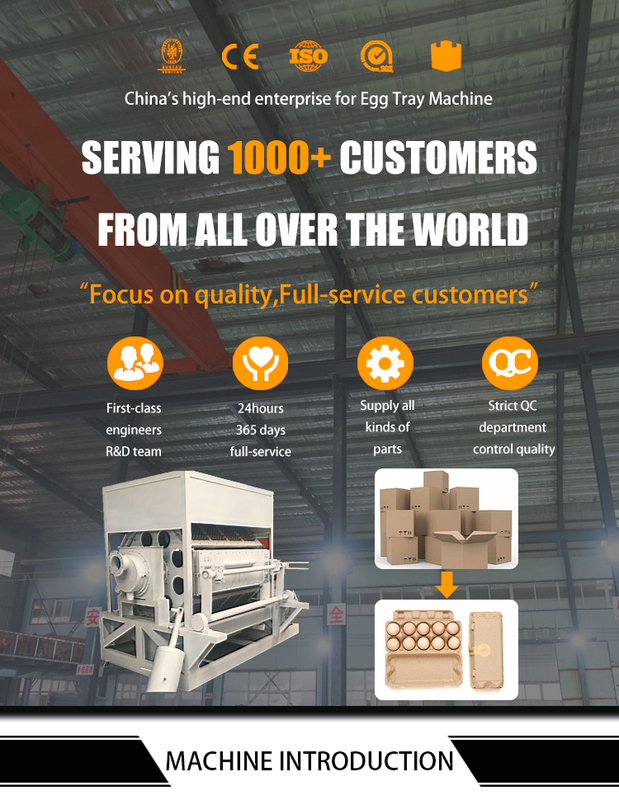 Our egg tray machines are used in a wide range of applications.Like 4 psc egg tray with lid,30 pcs duck egg tray ,Fruit tray,Wine tray,Cup tray,ect.If you wants to make a special shape of the egg tray, you can send us the design drawings or samples,.Our engineers will design according to the customer's requirements. If you wants to customize the company logo on the egg tray, we can do it too. For more detailed requirements, please contact us. 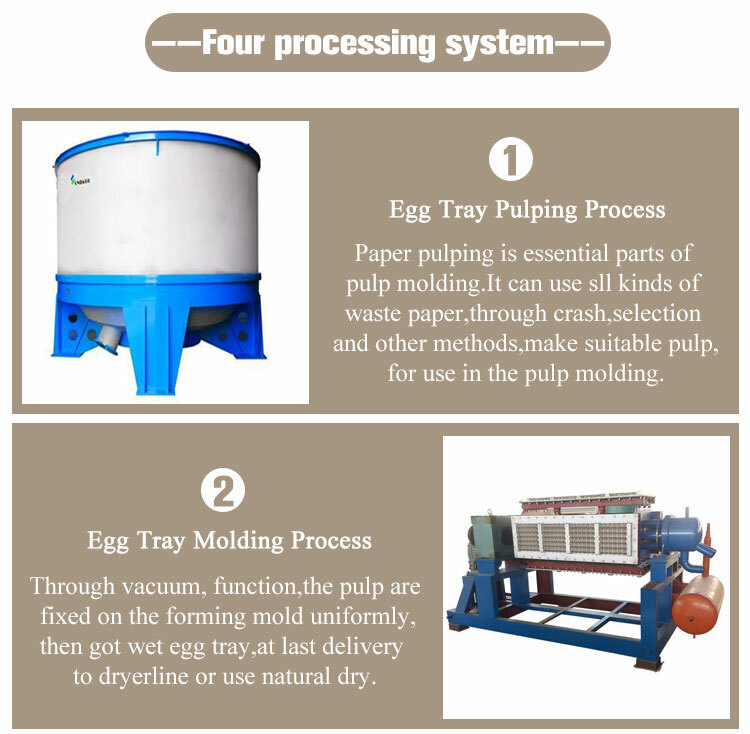 Q:How to choose a suitable egg tray making machine and production lines? 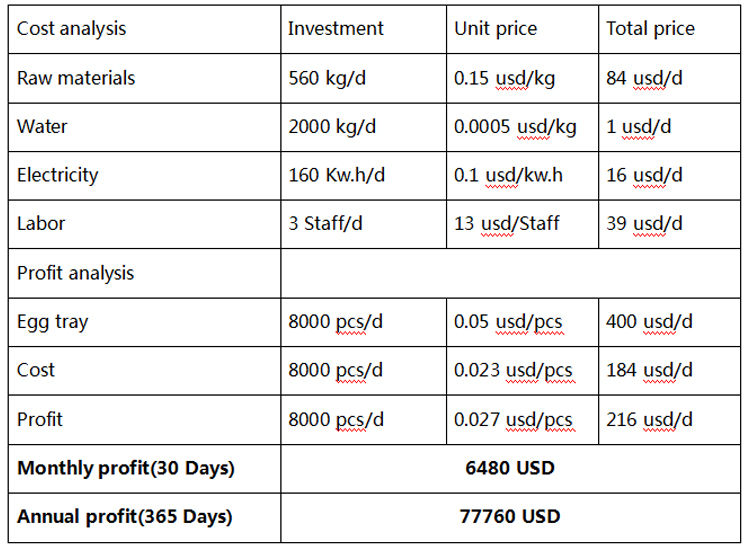 A:Just need tell us your requirement.We will make a good production plan according to your requirements. 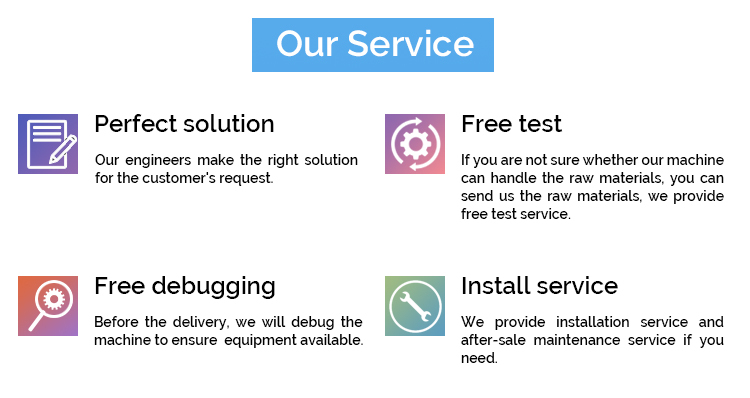 Q:Do you provide sample service? A:We can send you paper samples, which is produced by our machine. You also can send us the paper sample that you want to produce by DHL, etc.We will design according to your paper samples. Q:Do you have drying machine? A:Yes.We have traditional drying and multi-layer drying machine.If your capacity under 1000 pcs/h and the weather always sunny ,we suggest drying by natural way. 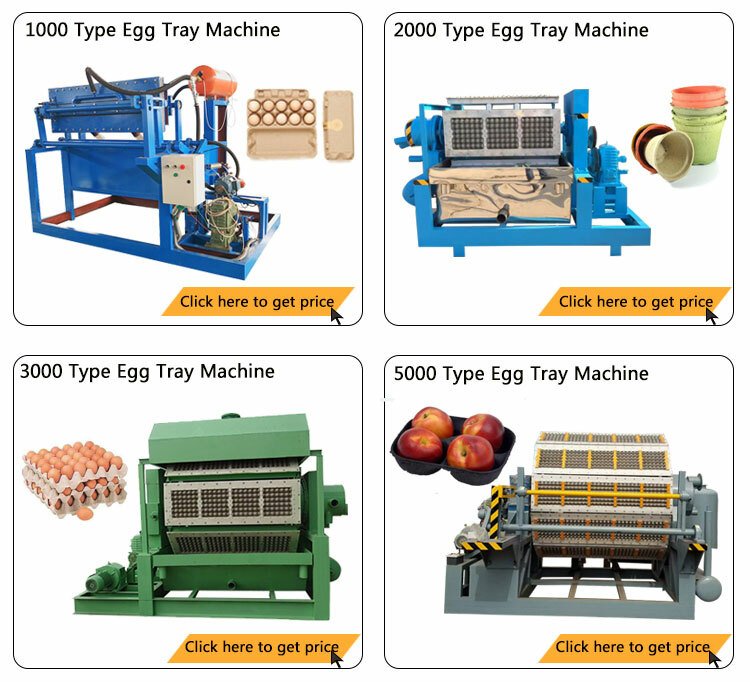 Q:What is the raw material of egg tray making machine? Q:Can you offer technician aboard for training workers? A:Yes, we have team for installation guidance aboard, technicians will be sent for installation guidance and training workers . 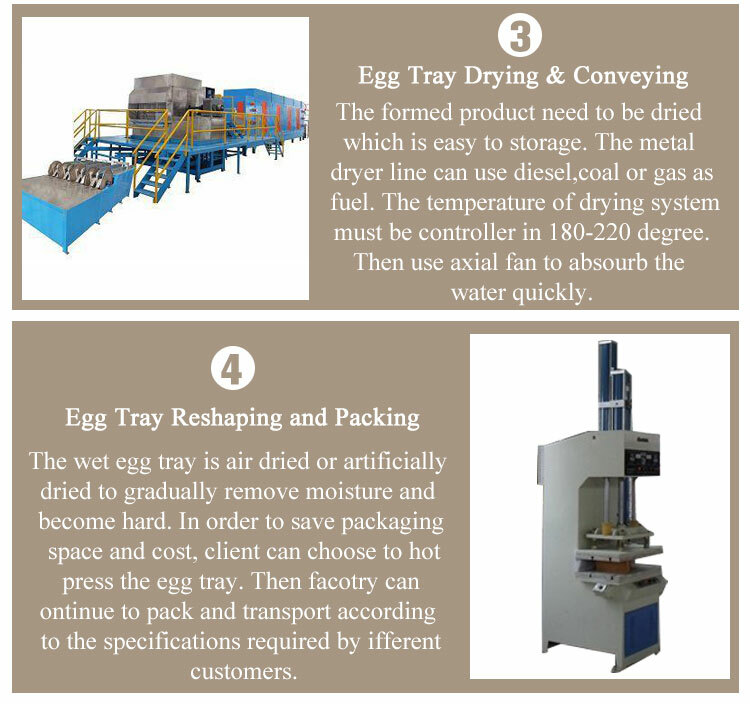 Q: What's the guarantee for the egg tray machine and equipment? A: Usually the forming machine guarantee is one year, and motors guarantee is half of an year. Q:Where is your company located? A: it is located in Zhengzhou city, Henan, china.